In the 1st match of the round robin play theand Glen Eagle Golf Club Griffins fell prey to the Inside Out Family Chiropractic Predators and gave up 4 of the 5 points in the 5 point system used for playoffs. Goal getters for the Predators were Shaun Heron from Mike Andreoli, Andreoli (unassisted), Andreoli from Austin Brown, Colin Fyffe from Andreoli, and Greg Keenan from Brett Appio. Griffin go getters were David ilijasic from Tim Vokey, Vokey from Joe Doan, and Doan from Cory Schittenhelm. 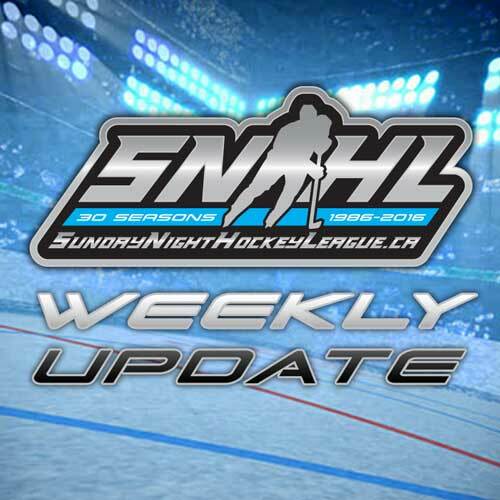 In a nail biter that saw the Pommies Cider Co. Wild hop out to a 2-0 lead in the first only to have Ainsley Fire Protection Fire answer back in the 2nd with a pair of their own, and then both teams swap goals in the 3rd so neither team took an advantage in the points and each ended with 2.5. Fire firers were Fab Iafano from Mark Andreoli, Ryan Wood from Sandro Mignosa, and Mignosa (unassisted). Wild whippers were Marc de Abaitua from Kevin Bowen, Matt Moss from Bowen, and Bowen (unassisted). The Ken’s Lawn Mower Repairs Ltd. Blades jumped out to the early lead in the 1st frame when Cam Coulter got a lucky bounce and the puck ended up in the back of the twine tent, after that the Sports Marketing All Stars got down to business and potted a pair in the 2nd with Ron Toffan from Matt Dowdle, and Kevin Norris from Kevin Christie being the heroes. The 3rd saw end to action with no one being able to bury the biscuit, giving the Stars 3.5 and the Blades 1.5 points. The last game of the night saw two evenly matched teams be stingy with the goals and not be able to best the other. St. Louis Bar & Grill Wings flew high potting a pair in the second with Daniel Hamlett and Bob McHardy doing the damage with no help. Moose main man was Jay Beech who got one back in the second from Steve Hutchins and one in the 3rd to give both teams 2.5 points.